Asia has emerged as a fast growing market for Brisbane and Queensland, driven by rapid expansion from Asian airlines. In Jun-2019 Thai AirAsia X and Royal Brunei Airlines will become the sixth and seventh airlines from Asia to launch services to Brisbane since 2017. In Jul-2019 the Brisbane-Asia market will be served with 137 weekly frequencies, generating approximately 34,000 weekly one-way seats. In Jul-2016 the Brisbane-Asia market was served with only 87 weekly flights, generating approximately 24,000 weekly one-way seats. The new services to Asia are important for Queensland and its tourism industry, which accounts for 4% of Queensland's GDP. China has become the largest source market for Queensland while Japan is the third largest source market. Other Asian markets are smaller but have been growing, and the rate of growth should accelerate as new nonstop flights stimulate demand. Thai AirAsia X and Royal Brunei are launching services to Brisbane in June, joining a growing list of Asian airlines that have launched Brisbane over the past couple of years. Securing AirAsia is a breakthrough for Brisbane, given that Asia's largest LCC group has never served Brisbane. Brisbane will be served by 14 Asian airlines this winter, compared to only six in (southern hemisphere) winter 2016. Brisbane-Asia frequencies have increased by nearly 60% over the past three years and seat capacity has increased by more than 40%. Brisbane is by far the largest international airport in Queensland; the other two airports with services to Asia (Cairns and Gold Coast) have not been growing as rapidly as Brisbane. The rapid growth in the Brisbane-Asia market and the outlook for the Brisbane and Queensland aviation sectors will be discussed at the CAPA 2019 Queensland Aviation and Corporate Travel Summit, which will be held on 6-Mar-2019 in Brisbane. For more details on the summit click here. Over the past two years Brisbane has secured new services from a staggering seven Asian airlines – Air China, Hainan Airlines, Malaysia Airlines, Malindo Air, Philippine Airlines (PAL), Royal Brunei Airlines and Thai AirAsia X.
Malindo entered the market in Mar-2017 with a service from Kuala Lumpur via Bali. Hainan Airlines entered in Sep-2017 when it launched a service from Shenzhen, followed by Air China in Dec-2017 with a service from Beijing. Last year was another big year for Brisbane Airport as PAL launched a nonstop service from Manila in Mar-2018 and Malaysia Airlines resumed services from Kuala Lumpur in Jun-2018. This year is shaping up again to be a big year for Brisbane following recent announcements from Royal Brunei and Thai AirAsia X. Royal Brunei is resuming services from Bandar Seri Begawan on 11-Jun-2019 and Thai AirAsia X is launching services from Bangkok on 25-Jun-2019. An eighth Asian airline, China Eastern, entered the Brisbane market in Jan-2016 and has been serving Brisbane year-round since Dec-2016. Securing Thai AirAsia X is particularly significant as it marks the first time any AirAsia airline has served Brisbane. The Malindo launch in 2017 marked the first time a Lion Group airline had served Brisbane. Air China and Hainan are also new airlines for the Brisbane market. Malaysia Airlines and Royal Brunei are not entirely new; Malaysia Airlines initially suspended Brisbane in 2015 and Royal Brunei suspended Brisbane in 2011. PAL has served Brisbane since 2013 but for the first five years only offered a one-stop product via Darwin. Manila is therefore a new nonstop destination for Brisbane (as are Beijing, Shenzhen and Shanghai). Bangkok is not a new destination for Brisbane as it is already served by Thai Airways. Bali is also not a new destination as it is was already served by Jetstar Airways and Virgin Australia when Malindo became the third competitor. Brisbane currently has 13 nonstop destinations to Asia, although only 12 are served year-round because Beijing is seasonal. The upcoming resumption of Bandar Seri Begawan will give Brisbane 13 year-round destinations in Asia. Two years ago, in early 2017, Brisbane had nine year-round destinations in Asia: Bali, Bangkok, Guangzhou, Hong Kong, Kuala Lumpur, Singapore, Shanghai, Taipei and Tokyo Narita. The city had only eight year-round destinations in Asia slightly more than two years ago because Shanghai only became year-round in late 2016. The upcoming addition of Royal Brunei and Thai AirAsia will give Brisbane services from 14 Asian airlines in Jul-2019. This excludes Air China, since Air China is not serving Brisbane this winter. In Jul-2016 Brisbane had services from only six Asian airlines – Cathay Pacific, China Airlines (CAL), China Southern Airlines, EVA Air, Singapore Airlines (SIA) and Thai Airways. Jetstar, Qantas and Virgin Australia also serve the Brisbane-Asia market but the three Australian competitors account for less than a 30% share of total Brisbane-Asia seat capacity. Qantas has a long-standing daily service to Singapore and a daily service to Tokyo Narita that was launched in 2015. Jetstar launched four weekly services to Bali in 2014 and upgraded the service to daily in early 2018. Virgin Australia is a long-standing competitor in the Brisbane-Bali market and currently operates nine to 10 weekly frequencies on the route. Emirates also competes in the Brisbane-Singapore market with a daily service that continues to Dubai. Emirates has operated this flight (as well as a nonstop flight from Brisbane to Dubai) for several years, but Brisbane-Singapore-Dubai was temporarily suspended for five months in 2016. Notes: based on week commencing 8-Jul-2019 and week commencing 11-Jul-2016. Emirates' Brisbane-Singapore-Dubai service was temporarily suspended in Jul-2016 due to a runway upgrade project at Dubai. In addition to all the new nonstop competitors in Brisbane-Asia market, most of the existing competitors have added frequencies over the past few years. SIA will have 7,910 weekly one-way seats from Brisbane in Jul-2019, giving it a leading 23% share of total Brisbane-Asia seat capacity. None of the other Asian airlines serving Brisbane will have more than one daily frequency this winter, but several airlines have upgraded their services to daily in recent years and Cathay Pacific offers a more than daily service in summer. Cathay introduced four additional seasonal frequencies on Brisbane-Hong Kong in 2017 and has since offered 11 nonstop frequencies in the southern summer season, but still has only seven frequencies in the southern winter season. EVA introduced two additional frequencies on the Brisbane-Taipei route in Oct-2016 and has since operated four to five frequencies (depending on the time of year), compared to two to three frequencies previously. In late 2018 China Airlines (CAL) upgraded its Brisbane-Taipei service to daily most of the year (there are still a few weeks it operates a reduced number of frequencies). China Southern has operated a similar almost year-round daily schedule to Brisbane since Oct-2015; there are a few weeks it operates a reduced number of frequencies. Thai Airways has been the only Brisbane-Asia competitor to reduce capacity in recent years. In Oct-2018 Thai Airways cut the Brisbane-Bangkok route back from seven to four weekly frequencies, leaving an opening that will soon be filled by AirAsia. The additional services from the existing competitors along with the several new services have driven a nearly 60% increase in Brisbane-Asia weekly frequencies over the past three years (from 87 in Jul-2016 to 137 in Jul-2019). Seat capacity has increased by more than 40%: from approximately 24,000 one-way weekly seats in Jul-2016 to approximately 34,000 weekly one-way seats in Jul-2019. 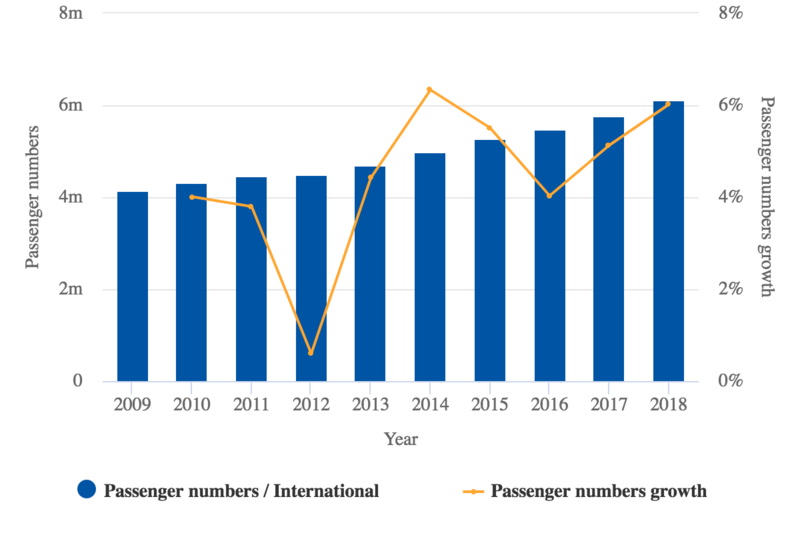 The higher increase in frequencies compared to seat capacity is due to the introduction of re-engined narrowbody aircraft, which have improved the economics of thinner long haul routes from Brisbane to Asia. Without these aircraft it is unlikely that Brisbane would have been able to attract new services to Bandar Seri Begawan and Manila. Brisbane-Bandar Seri Begawan and Brisbane-Manila are both seven-hour routes, making them ideal for A320neo or 737 MAX family aircraft but outside the range of A320ceos or 737NGs. As these are thin routes, widebody aircraft are generally too big and not viable. Until recently the only narrowbody route from Brisbane to Asia was Bali, which is the shortest Brisbane-Asia route. Malindo and Virgin Australia now operate Brisbane-Bali with 737-800s (the extra range offered by the 737 MAX is not needed for Brisbane-Bali). Jetstar currently uses 787-8s on Brisbane-Bali but plans to switch to A321neoLRs after it takes delivery of the new type in 2020. Brisbane was the first route for PAL's new fleet of new long haul configured A321neos. In 2018 PAL took six long haul configured 168-seat A321neos, which feature 12 lie-flat business class seats and 156 economy seats offering seatback IFE. The first aircraft was deployed on Manila-Brisbane in early Jul-2019. PAL launched nonstop services from Manila to Brisbane in Mar-2018 but initially had to use A340-300s due to delivery delays with the A321neo. With the introduction of the A321neo, PAL was able to increase frequencies to Brisbane from three to four weekly services. The new year-round five weekly flight schedule will give PAL 1,680 weekly seats in the Brisbane market, which is a 2.5% share of total Brisbane-Asia seat capacity. While this is relatively small, the service is strategically important for Brisbane and southern Queensland as it has stimulated demand in a fast growing source market. There is also growing outbound traffic from Brisbane to Manila as the Philippines has emerged as a popular destination for Brisbane area residents. Although Manila is not a big draw, PAL is offering Brisbane passengers domestic connections to several popular beach destinations in the Philippines. Royal Brunei is deploying its new fleet of A320neos to launch Brisbane in 11-Jun-2019. In 2018 the airline took delivery of seven 150-seat A320neos, which are configured with 12 recliner business class seats and 138 economy seats featuring seatback IFE. Royal Brunei will initially serve Brisbane with four weekly services, generating 1,200 weekly seats and representing less than 2% of total Brisbane-Asia capacity. Again, this is small, but is strategically important as Royal Brunei will stimulate demand in the Brisbane-Brunei and Brisbane-UK market. Brunei is a tiny source market for Queensland and there is also limited outbound demand in the Brisbane-Brunei market. However, these segments will grow (from a very low base) as nonstop services are resumed. Of more significance is the impact the new Brunei service will have in the Brisbane-UK market. The UK is the fourth largest source market for Queensland and London is also a very popular destination for Brisbane area residents. Royal Brunei is timing its new Brisbane service with a ground time in Brisbane of more than 12 hours in order to facilitate connections with its new nonstop service to London in both directions. The long ground time is inefficient, and not ideal from a cost standpoint, but necessary because Royal Brunei needs to attract significant Brisbane-London traffic in order to make the Brisbane-Bandar Seri Begawan route viable. Royal Brunei is offering a 1hr 25min layover in Brunei for Brisbane-London passengers and a 2hr 05min layover for London-Brisbane passengers. Quick connections in Brunei are also available to Brisbane-Dubai passengers, providing a one-stop alternative to Emirates' nonstop product, as well as to Kuching in Malaysia and some destinations in North Asia. However, making the Brisbane-Bandar Seri Begawan route work will not be easy because Brisbane-London – which Royal Brunei will need to rely on for a large proportion of its Brisbane passengers – is a very competitive and low yielding market. Return fares of less than USD1000 are often available on several airlines. Royal Brunei has been offering Brisbane-London fares below USD800 for travel on selected dates in 2H2019. With the offer of such low fares it will be hard for the new Brisbane-Brunei route to deliver sustained profitability – even with incentives from Brisbane Airport and Queensland. Brisbane's Attracting Aviation Investment Fund (AAIF) played an important role in attracting Royal Brunei, as well as the other new airline for 2019, Thai AirAsia X. In 2018 the fund helped woo Malaysia Airlines, which is now offering competitive fares in the Brisbane-London market, as well as helping to drive an increase in Malaysian visitors. AAIF is supported by the Queensland Government, Tourism and Events Queensland and Brisbane Marketing. The objective is to stimulate demand in key source markets such as the UK, Malaysia and Thailand. 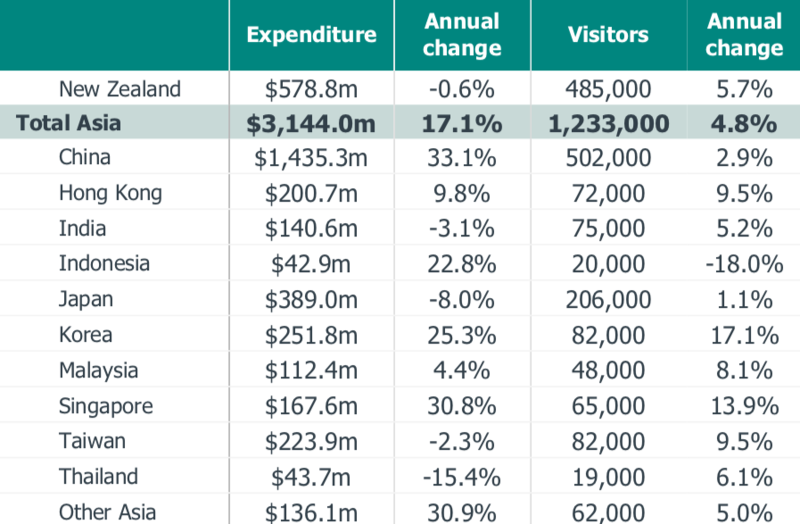 Tourism Research Australia reported a 5% increase in Asian visitors to Queensland in the year ending Sep-2018, to 1.233 million, and a 17% increase in expenditure from Asian visitors, to AUD3.144 billion. UK visitor numbers were up 4%, to 235,000 (but UK expenditure was flat, at AUD422 million). China is the largest source market and has grown rapidly over the past several years. However, Chinese visitor numbers to Queensland were up by a relatively modest 3% in the year ending Sep-2018, according to Tourism Research Australia data (based on international visitor surveys). Visitor numbers from New Zealand, the second largest source market, were up by 6%. Visitor numbers from Hong Kong, Korea, Malaysia, Singapore and Taiwan were up by at least 8%. Thai visitor numbers were up 6% to 19,000. Source: Tourism and Events Queensland, citing Tourism Research Australia. Brisbane expects that Thai AirAsia X will stimulate demand and bring more Thai visitors to southern Queensland. While most passengers on the new Brisbane-Bangkok service will likely be Australians (as Thailand is one of the most popular holiday destinations for Brisbane area residents), there will be significant available capacity for the inbound market. Thai AirAsia X will operate four weekly A330-300 services to Brisbane from 26-Jun-2019, generating 3,016 weekly seats for the Brisbane market. It will be Thai AirAsia X's first Australia service; Thai AirAsia X launched operations in 2014 and, until now, has focused on the North Asian market. The AirAsia Group's selection of Brisbane-Bangkok as its first route connecting Australia and Thailand was a surprise move and represents a major victory for Brisbane Airport, given that the group does not currently have any services to Brisbane Airport. Typically, an LCC group follows a connect the dot strategy as it grows in an overseas market, enabling it to leverage existing contracts with airports, ground handlers and other suppliers. In Australia AirAsia has now deviated from this strategy by selecting Brisbane. AirAsia currently serves Gold Coast Airport, which is located only 100km from Brisbane, as well as Melbourne Avalon, Perth and Sydney. The group serves all four of these Australian destinations from Kuala Lumpur and also serves Perth from Bali. Gold Coast Airport was obviously keen to attract Thai AirAsia X as it does not currently have any link to Bangkok. It may now have to work hard to make sure it does not lose its existing AirAsia service (from Kuala Lumpur) to Brisbane. In Dec-2018 Melbourne Tullamarine lost its only AirAsia route, a twice daily service from Kuala Lumpur, to rival Avalon. Gold Coast was Malaysia AirAsia X's very first destination when it launched services in late 2007. Kuala Lumpur is currently one of only three Asian destinations for Gold Coast Airport, along with Singapore (operated by Scoot) and Tokyo Narita (operated by Jetstar). Hong Kong Airlines suspended services to Gold Coast in Oct-2018 after operating a Hong Kong-Gold Coast-Cairns-Hong Kong triangle route for nearly three years. While Brisbane has attracted a large increase in Asia capacity over the past few years, Gold Coast has experienced a reduction. In Jul-2019 Gold Coast will have 17 weekly services from Asia, consisting of seven from Kuala Lumpur, five from Singapore and five from Tokyo. By contrast, in Jul-2017 Gold Coast had 27 services from Asia: 11 from Kuala Lumpur, seven from Tokyo, five from Hong Kong and four from Singapore. Cairns is the only other airport in Queensland that has scheduled international services in summer 2019. Townsville lost its only scheduled international services (Bali and Port Moresby) in 2018 and Sunshine Coast's only international service (Auckland) is only operated in the winter. Townsville is keen to secure an Asian route (AirAsia X from Kuala Lumpur is a possibility, particularly if AirAsia X acquires A321neoLRs); Sunshine Coast is hoping to attract services from Asia once a runway extension project is completed. Cairns has eight destinations in Asia: Bali, Guangzhou, Hong Kong, Osaka, Shenzhen, Shanghai, Tokyo Narita and Singapore (based on OAG schedules for the week commencing 11-Feb-2019). The Cairns-Asia market has grown in recent years but not significantly, and it is a highly seasonal market. Cairns will have 30 weekly services to Asia in Jul-2019, compared to 26 frequencies in Jul-2016. In Nov-2018 Cairn's Asia traffic declined by 9% to 40,000 passengers. Brisbane dominates Queensland's international market and the gap with the smaller airports has been widening. Brisbane international passenger traffic grew by 5% in 2018, to 6.1 million, whereas Cairns' international passenger traffic grew by less than 1% in 2018, to 687,000. Gold Coast reported a 5% drop in international passenger traffic for 2018, to 1.1 million. Brisbane's international traffic has grown steadily over the past decade, with positive growth every year. Brisbane has reported international growth of at least 4% for six consecutive years. Source: CAPA - Centre for Aviation, BITRE and airport reports. Brisbane has particularly been successful at driving a new phase of Asia growth – an encouraging sign as the airport prepares to open a second runway in 2020. The growth in Asia is also encouraging for Queensland tourism, which is an important component of the local economy. There are still several obvious white spots in Brisbane Airport's international network, including Delhi, Jakarta, Mumbai and Osaka. India is Queensland's ninth largest source market and is by far the largest source market in Asia Pacific that is not yet served nonstop. Several secondary Chinese cities are also a target. There are huge opportunities in the Queensland-China market, considering that Sydney has 17 Chinese destinations compared to only four for Brisbane (based on OAG schedules for the week commencing 11-Feb-2019). Potentially, the demand and the incentives are in place to attract new services to China, India, Indonesia and Japan before the opening of Brisbane's second runway. The new services from AirAsia and Royal Brunei are just the latest chapter in a growth story that is still unfolding.